Nat mur, or natrum muriaticum, is a remedy used in homeopathic medicine. Homeopathy, developed by Dr. Samuel Hahnemann in 1796, is based on the philosophy that "like cures like." In an attempt to treat symptoms, minuscule amounts of plant, mineral or animal substances are given that--in larger amounts--would cause the same symptoms in a healthy person. Homeopathy is an alternative therapy, and not meant to replace medical treatment. If you would like to try the nat mur homeopathic remedy, discuss it first with your doctor. Natrum muriaticum is made from sodium chloride, or table salt, which may be mined either from underground deposits of rock salt or from man-made or natural salt flats. 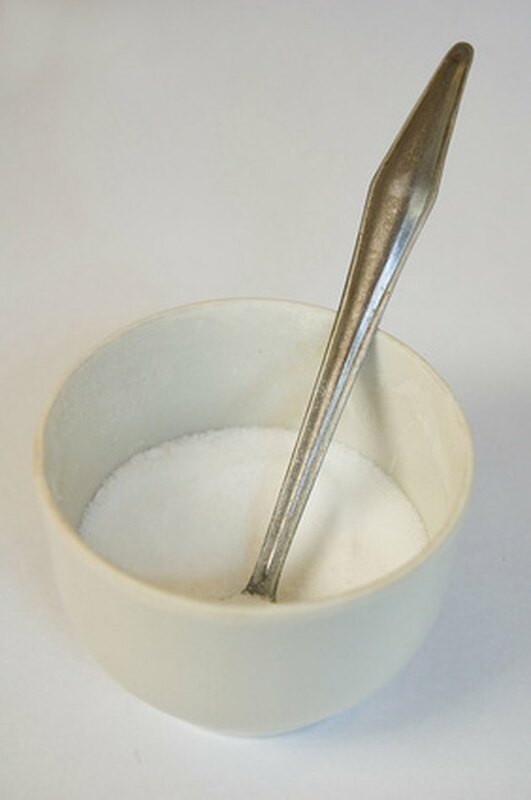 Beneforce states that the coarse salt is boiled and filtered; the resultant substance is triturated with lactose sugar to make the mother tincture. The mother tincture is then diluted and shaken, or succussed, many times to create the homeopathic remedy. According to the National Center for Complementary and Alternative Medicine, most homeopathic remedies are so dilute that no molecules of the healing substance remain; however, homeopaths believe that the substance has left behind its imprint, or essence, in the remedy. Homeopaths consider natrum muriaticum particularly useful for treating menstrual irregularities, as well as complaints linked to menstruation such as fatigue, water retention, and menstrual migraines. Blue Shield Complementary and Alternative Health concurs that nat mur is often used for menstrual problems, and lists a craving for salt, extreme thirst, and a tendency to feel worse after being in the sun as symptoms that indicate that nat mur is the correct remedy. Beneforce notes that homeopathic practitioners also prescribe nat mur for colds and flu, particularly if there is a clear, runny nasal discharge that worsens in the morning, or a dry cough that develops after a period of watery chest congestion. A homeopath may also recommend nat mur for skin complaints-- such as warts, pimples, boils, psoriasis, and excessive oiliness--for backache, and for constipation. Homeopathic practitioners believe that remedies may not work properly if not suited to the personality traits of the patient. According to Beneforce, people most likely to benefit from nat mur tend to be sensitive, inhibited, self-centered, and prone to depression and moodiness. Blue Shield Complementary and Alternative Health adds that these patients seem reserved, but can become angry when others try to comfort or sympathize. Herbs 2000 asserts that nat mur personality types are by far the most common constitutional type, and attributes this fact to the average individual's tendency to suppress emotional pain. The National Center for Complementary and Alternative Medicine reports that most analyses of homeopathy have found there is little evidence to support it as an effective treatment for medical conditions, but acknowledges that some studies have been positive, In addition, the NCCAM notes that there is anecdotal evidence that homeopathy does work. There has been very little research on the side effects of nat mur and other homeopathic remedies. Blue Shield Complementary and Alternative Health states that homeopathic remedies have been regulated in the United States since 1938, and are considered safe. The National Center for Complementary and Alternative Medicine concurs, but states that homeopathic remedies should only be used under the direction of a trained professional.